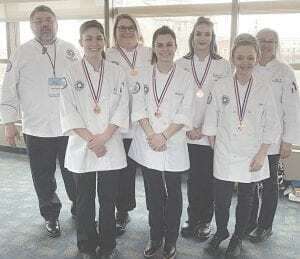 FLINT — The Mott Community College (MCC) Culinary Knowledge Bowl earned a Bronze medal March 31 at the 2019 Central Region competition of the Baron H. Galand Culinary Knowledge Bowl. The competition is held annually at the American Culinary Federation ChefConnect conference. This year the competition was in St. Paul Community College in St. Paul, Minn. The MCC team competed with five teams from the Central region. “I am extremely proud of our students,” said Chef Mark Handy, MBA CEC, AAC, CDM Culinary Arts Instructor and MCC Knowledge Bowl coach. “They represented the College and our Culinary Arts program well,” he added. The 2019 team included Jessalyn Taylor, Team Captain, of Chesaning, Kinleigh Jaehnig, of Lapeer, Jennifer Stock, of Lapeer, Martina LaNoue, of Otter Lake, and Dawn Neusbaum, of Flint. Serving as assistant coaches were Lata VonBrockdorff, Mary Sushynski and Tina Wilder. This is the 6th year that MCC has sent a team to the competition, which is based on a Jeopardy-style question and answer format that also includes sensory testing. Students must have an in-depth knowledge of math, sanitation, meat fabrication, seafood, nutrition, baking, culinary and Escoffier. During the competition, students are tested on visual identification of equipment, utensils, food products, and they must be able to identify food items based on taste and smell. Once a question is presented, students have only 10 seconds to answer, with speed, strategy and accuracy being key components to their success. First held at the 1992 ACF National Convention in Washington, D.C., the Baron H. Galand Culinary Knowledge Bowl is the brainchild of Carol Kelly, a member of the Nation’s Capital Chefs’ Association and a culinary instructor. She used the competition format as a way of testing her vocational high school students. The competition is named in honor of former ACF President and long-time advocate of apprentices and junior members, Baron H. Galand, CEC. — G.G.